The Russian military has announced the delivery of new air defence missiles to Crimea, in a move scheduled before the latest tension with Ukraine. The S-400 Triumph missile systems were earmarked for troops in Crimea last month, Russian media said at the time. Moscow also announced exercises in Crimea next week to simulate an attack by weapons of mass destruction (WMD). Russia, which annexed Crimea from Ukraine in 2014, said this week it had foiled a Ukrainian sabotage mission. It accused the Ukrainian government in Kiev of trying to send saboteurs into Crimea and reported the deaths of a soldier and a secret police officer in an operation to foil the alleged plot. Russian Prime Minister Dmitry Medvedev said Moscow might be forced to cut diplomatic ties with Ukraine if the crisis worsened. Denying the accusations, Ukraine placed its troops on alert along its de facto border with Crimea, and along its front line with Russian-backed rebels holding parts of Donetsk and Luhansk in the east. 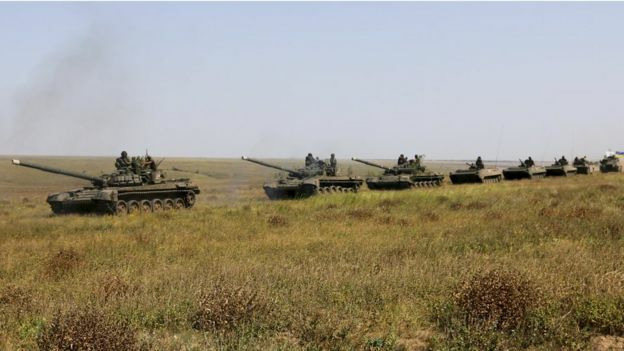 A column of Ukrainian tanks could be seen rolling towards Crimea on Friday. A statement by Russia's Southern Military District, which incorporates Crimea, said the missiles had been received by an air defence regiment in Crimea. According to the statement, quoted by Russian news agencies, the missiles were successfully tested on the Kapustin Yar test range in southern Russia. Russia's Interfax news agency says the missiles are designed to hit airborne targets at a range of up to 400km (249 miles) and ballistic missiles at a range of up to 60km, flying at speeds of up to 4.8km per second. The missiles are being installed in Crimea to protect Russia's Hmeimim air base in Syria among other things, it adds.